This a relatively new restaurant in my nabe of PLG. So if you ever find yourself in Prospect Park or the Brooklyn Botanical Garden - make this your go-to dining spot for after. The burgers are out of this world and stacked with ingredients that only make perfect sense once you take that first bite. The margaritas (although too pricey for my taste) are so delicious - it only makes sense to order a pitcher. Trust... You will regret not ordering a pitcher once you're on your last sip. I haven't had brunch here yet, but highly recommend the namesake Burger Mexicano (it's a no-brainer). 545 Flatbush Avenue, Prospect Lefferts Garden, BK - get more info here. I went here one sweltering day last fall for brunch and never had the chance to include it in a round-up. Probably because I fell into a food coma shortly after my dining experience. I didn't realize how much of a magnet this was for the "hipsters" but at the same time the food is amazing, the bloody mary revived me after my hangover, and the decor was so Instagrammable. Unfortunately, I was too hungover to take any snaps - but did feel blessed to come across and enjoy a banging meal here. If you're not in the mood for a hearty meal, head to their bar for delicious cocktails. 138 Division Street, Chinatown - get more info here. Ever get so hungry that you can't even think straight and therefore can't make a decision on where to eat... So you end up at Subway. Yea me too. BUT, one day after walking for blocks and blocks while my stomach was eating itself I found myself at Don Chingon. It was pretty empty which made me think it was either pricey or bad, at the same time I could care less. So I plopped down and ordered. What arrived at my table were three fantastic tacos with the most amazing homemade tortilla shells. It was like I was transported back to my aunt's kitchen and of course ordered more tacos. The margaritas were bomb too - I opted for a spicy one to go with my tacos. This spot is a little pricey compared to other Mexican joints but at the same time... The food is so GOOD that it all evens out. And obviously, get the tacos if you go there. 216 Flatbush, Prospect Heights, BK - get more info here. So you're probably thinking "what's with you and all this Mexican food?" Girl, I can not help what my tummy lures me to and it's always been a no-fail option. The day I eat horrible Mexican food I'll probably curl up and die. ANYWAYS, Mission Cantina is a spot that is synonymous for having bangin' burritos that are anything but the usual Mexican fare. The chef Danny Bowien is always changing up the menu and experimenting which I love. If you're not into boring head here and try the Burritos (obvi) and the wings. 172 Orchard Street, Lower East Side - get more info here. Feastin' with Naureen from Kitchen3N.com! Hello, The Style Boro readers! My name is Naureen Akhter, owner of Kitchen3N.com I am a blast from your lovely host's past: Aileen and I went to junior high together where our shenanigans ranged from prank calling boys we had crushes on (Allan are you out there? Are you reading this? In case you are, Aileen Olmedo of class 701 officially had a crush on you. ), to attempting to perform Wiccan rituals in our friend's home, to having my first sexual encounter at her home (her dog humped my leg!). So when I invited her over for breakfast, I thought, what's something unique and delicious (and photogenic!) I can entertain her with? Turkish breakfast wins every time. Traditional Turkish breakfast spreads typically include cheese, olives, tomato, cucumbers, eggs, bread and Turkish sausage known as soujuk. The contrasting colors of the tomato, cucumber and olives always wows. The salty cheese and spicy sausage pair well with soft scrambled eggs. Bonus points for fresh squeezed orange juice or apple tea! Breakfast was the last meal I had with my husband during my babymoon to Turkey and one that will stay with me forever. Homemade granola and banana bread are not traditional, but they are in our house. Nothing perfumes the house like the smell of coconut toasting up in the oven or banana getting cozy with butter and sugar. So try your hand at this spread next time you're entertaining folks for breakfast (think: New Year's Day morning for a fun change up). The best part is - most of these things require little effort beyond buying the ingredients: the tomatoes and cucumbers you just slice and arrange. The sausage you prepare similar to bacon (slice and bake at 350 degrees on a rack over a sheet pan for 15-20 minutes). The bread, warm up in the oven on a sheet pan once the sausage is done. For the eggs, you can slice all the veggies beforehand, and scramble up right before your guests come. Heat oil in a large non-stick skillet or wok over medium-high heat. Add scallions, tomato, pepper and cook 4-5 minutes, until soft. Add cayenne, paprika and salt and cook for until tomatoes break down and onions get super soft, another 2-3 minutes. While the veggies cook, crack eggs into a bowl. Season with a bit of salt and pepper and whisk with a fork. Whisk well - until the eggs look like a uniform yellow mixture. Pour into skillet and lower the heat to low. Cook, stirring occasionally, until the eggs just start to set. Turn off the heat and add the parsley. Give it a final stir and serve with warm bread. You guys, brunch with Naureen was so delicious and my hunger for more Mediterranean adventures has increased ten-fold. For more scrumptious recipes head over to Naureen's blog (www.kitchen3n.com), Instagram (@kitchen3n), or if you're in NYC learn about her custom cake creations here. 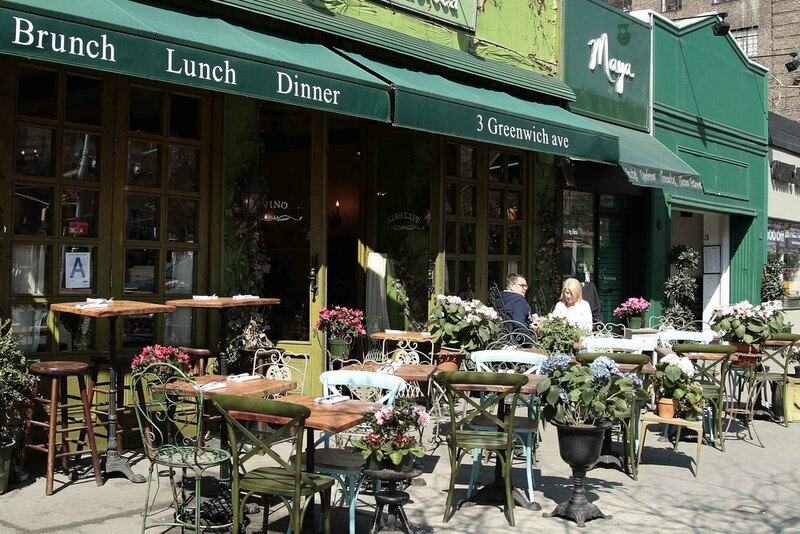 Let's head on down to Greenwich Village. One of my favorite neighborhoods filled with gorgeous stoops, quaint coffee shops, and lots of boutiques. I haven't been everywhere but that's what I love about New York City - there's always something new to discover. I've always had my eye on Olio e Piú, nestled between Greenwich Avenue (not street) and Christopher Street, so it was only a matter of time before dining there. I've passed by Olio e Piú many a times, the energy has always been vibrant and the outdoor seating is prime for people watching. The fall menu for this Neapolitan bistro has been created by Head Chef Dominick Pepe, filled with fresh fall ingredients. The night the boyfriend and I went for dinner it was a bit chilly so we sat inside but near a window. The decor throughout was rustic - dimly lit lamps with a verdant exterior decorated with vines and dotted with a variety of plants and flowers. In the back of the restaurant there's a large wood burning stove. Wood burning stoves equal amazing pizza crust and an amazing smokey flavor. Sidenote: I'm starting to get a few hunger pangs just thinking about this meal. We started off the night with the antipasto misto dish accompanied with fresh bread. However I tried to go easy on the bread knowing that we had a full course meal ahead us. You know, choosing my carbs wisely. The antipasto misto was followed by the burrata cheese - definitely our favorite app from the two. For dinner I had the Gnocchi al Gorgonzolaand (cheesy perfection) and the boyfriend had Corneto di Bufala (a pizza), which for him was a heavenly mixture of pizza crust cheese and Italian meats. I must mention that I ate from his plate as well and he had to fight me back with his fork. And yes, a food coma soon followed but not before I tried one of their cocktails (the Go-To drink made with cucumber vodka mmm) and gelato (obviously one of each flavor). We ended the night on a high note after dinner - everything was great from the atmosphere, food, and service. In the interim I heard great things about brunch so a return trip is necessary. If you're in the mood for scrumptious Italian food but can't afford a plane ticket to Italy, I highly recommend you book a table here for dinner (or brunch).